I’ve mentioned my dad’s strict dietary restrictions before, but it wasn’t until he began eating that way that I noticed how misleading healthy eating cookbooks, guides and restaurant menus can be. I’ve opened new “healthy dinners” cookbooks to find macaroni and cheese and beef stroganoff, or soups thickened with heavy cream and butter. If these are lightened up versions of the original, then I’m truly terrified of the original. Restaurants like Panera want to showboat as healthy alternatives for lunch, but some of their salads rival fast food cheeseburgers. Most people know that a caesar salad packs in the fat with cheese and heavy dressing, but what about Panera’s Orchard Harvest salad? It sounds absolutely incredible, boasting “field greens, crisp romaine, dried cherries, fresh pears, Gorgonzola, toasted pecans & our cherry balsamic vinaigrette.” Lovely leafy greens combined with fruit and just a hint of nuts, right? The Orchard Harvest salad contains 540 calories and 33 grams of fat, including 8 grams of saturated fat and 0.5 grams of trans fats. Don’t worry, you can also get 48% of your daily value of sodium, or 1140 milligrams. Yikes! I’ve been eager to share my Spicy Shrimp and Couscous recipe since the last time I made it earlier this week; it’s one of my favorites – quick, easy, spicy, healthy and full of flavor and zip. Buy a bag of frozen shrimp and just use it as needed (and if you’re like me, you can get your husband to remove any legs or tails still on the shrimp… Ghost Baker does NOT mess with shrimp parts!). Couscous smells wonderful when cooked, and did I mention that cooking it only takes five minutes? 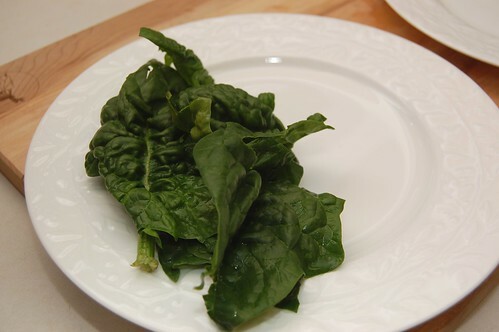 If you’re like Chef Edwin and can’t handle spice, then try toning down some of the spice either by decreasing or removing the cayenne and chili powder. If you love spice like I do, then please don’t wait to add this healthy dish to your dinner rotation! Begin to cook couscous according to package instructions. Mince garlic and set aside. 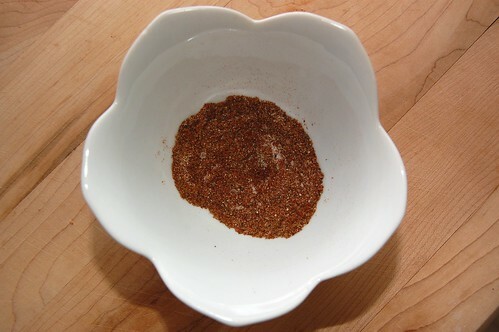 Combine and stir cayenne, salt, pepper, chili powder, paprika, garlic powder, and cumin together in a small dish. Fluff couscous when it’s done cooking and set aside, covered. 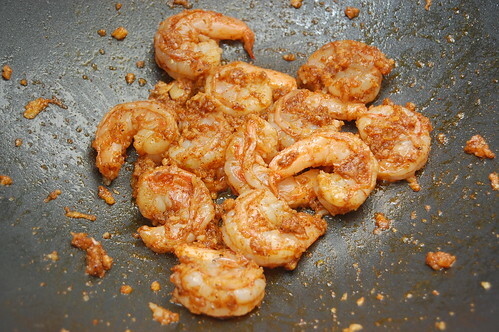 Heat wok on medium heat (you can use a skillet if you do not have a wok). When hot, add a little bit of oil to the wok. 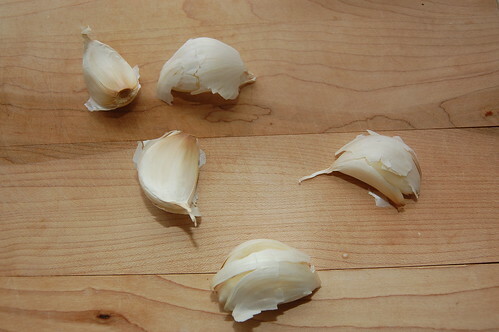 Add half of your garlic, stir for 30 seconds, then add peeled and thawed shrimp. Stir for 10 seconds and add remaining garlic along with spice mixture (it’s okay if you decide not to use all of the spice mixture). Cook, stirring occasionally, until shrimp are pink and curled. 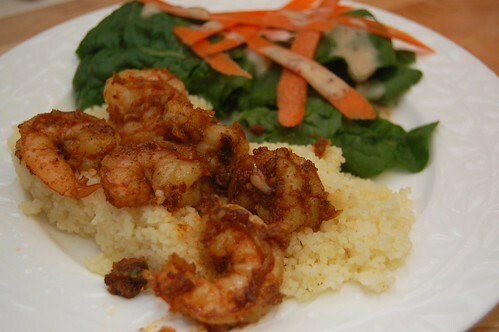 To serve, add leaf salad of your choice to a plate along with couscous and cooked shrimp. « Edible Art – Rainbow Cake! Stephanie – Thank you! I really enjoyed it (and the fact that I didn’t have to spend hours in the kitchen preparing it was just the cherry on top)! dudes, this looks so good too! why am i always on this blog when i’m hungry! Jane – it happens! Edwin and I seem to always discuss food and food ideas when we’re hungry. D’oh!